Our product range includes a wide range of mechanical automatic gas change over manifold, automatic change over manifold system, manual change over manifold system, line high pressure gas regulator, two cylinder manifold and semi-automatic manifold system. Mounting Dimension Size 500 mm(L) X 300 mm(H) X 45 mm(D). Mechanical Automatic Gas Change Over Manifold We are specialized in offering a world-class range of Mechanical Auto Gas Change Over. It can be used for multiple cylinders banks. Using premium quality components and ultra-modern techniques, this system is manufactured under the strict surveillance of our seasoned technocrats at our sound manufacturing unit. The provided system goes through numerous quality tests in order to ensure its functioning prior to supply at our patrons' end. Outlet Pressure Gauge 1 no. of 0 - 14 Kg Gauge. We hold expertise in offering an exclusive range of Automatic Change Over Manifold System that is broadly used for two cylinder system where automatically switching over is required from one cylinder to other, when the pressure in the one cylinder is below the set pressure. Under the guidance of talented professionals, our offered system is manufactured using quality tested components in tune with predefined industry standards and norms. Open the cylinder 2 and apply the pressure of cylinder 2 ( Line 2 ) to the manifold. 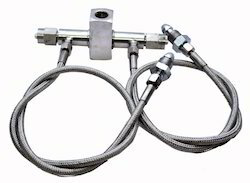 Banking on our skilled professionals, we are engaged in manufacturing and supplying Manual manifold system. Offered rangeis designed to provide an uninterrupted supply to any application requiring no down-time. As the primary supply is depleted a reserve supply is waiting to automatically begin service. In ahead of their final dispatch, these systems are inspected on various parameters. Through pressure differential the switchover takes place without interruption of service, once depleted the primary bank can be replaced and becomes the new reserve bank.Mechanical-Auto Gas Change Over Auto Gas Change Over Athena Make High pressure Mechanical- Automatic Gas Manifold is used for two cylinder system where automatically switching over is required from one cylinder to other, when the pressure in the one cylinder is below the set pressure. 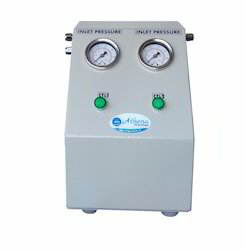 Setting of pressure of two cylinder can be set as per user requirement (Refer Setting Procedure).It can be used for multiple cylinders banks. Gas services : Air, N2, H2, He, Ace, Arg, N2o, P10 and other gas & also for flammable / nonflammable &corrosive gases. Gas Line High Pressure Gas Regulators, Manual Ripening Systems are specially designed by our company for fruit ripening applications. This system is equipped with the entire essential ripening accessories for its flawless functionality. In this ripening system, the process is taken in cold rooms by using gas cylinder or cans. These ripening systems are available in distinguished sizes, capacities and specification to meet with the requirements of our wide client base. Outlet Connection Y4" OD ferruel fitting with ball valve. Available in brass chrome plated & SS316 body for inert & corrosive gas. Can be connected with one or more than one cylinder. 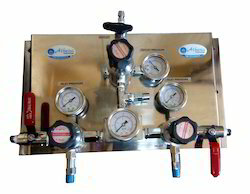 High pressure Mechanical- Automatic Gas Manifold is used for two cylinder system where automatically switching over is required from one cylinder to other, when the pressure in the one cylinder is below the set pressure. 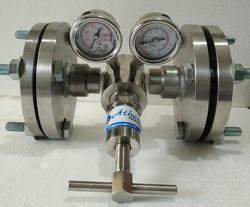 Setting of pressure of two cylinder can be set as per user requirement (Refer Setting Procedure). It can be used for multiple cylinders banks. we are manufacturing and supplying a comprehensive range of Simple Manifold System XR (O2, N2, Ag, He, Zero Air, H2, D/A, CO2, HCL, NH3, N2O, SF6, Methane, Ethane, Propene, Clorine, Krypton, Neon, Lesar Gas etc.) Offered products are manufactured by our skilled professionals using the best technology to render maximum clients' satisfaction. In order to meet variegated demands of clients, these are made available in various customized options. Semi-Automatic Manifold System Banking on our skilled professionals, we are engaged in manufacturing and supplying Semi-Automatic manifold system. Offered rangeis designed to provide an uninterrupted supply to any application requiring no down-time. As the primary supply is depleted a reserve supply is waiting to automatically begin service. In ahead of their final dispatch, these systems are inspected on various parameters. Through pressure differential the switchover takes place without interruption of service, once depleted the primary bank can be replaced and becomes the new reserve bank. We are instrumental in providing our clients with a perfect quality Gas Cylinder Manifold. These products are widely demanded by our clients for their features. we are manufacturing and supplying a comprehensive range of Simple Manifold System XR (O2, N2, Ag, He, Zero Air, H2, D/A, CO2, HCL, NH3, N2O, SF6, Methane, Ethane, Propene, Clorine, Krypton, Neon, Lesar Gas etc.) Offered products are manufactured by our skilled professionals using the best technology to render maximum clients' satisfaction. In order to meet variegated demands of clients, these are made available in various customized options. Low pressure digital automatic change over working with pressure sensor & solenoid valve. 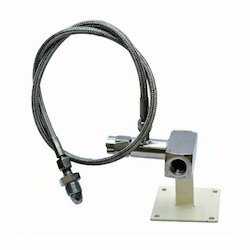 Available in brass chrome plated & SS316 body for inert & corrosive gas. 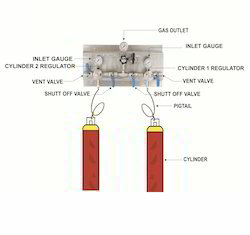 Can be connected with one or more than one cylinder. 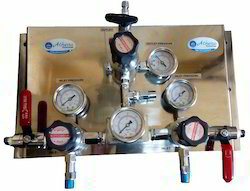 Looking for Gas Manifold System ?